There should be a word for that feeling of utter joy and sheer satisfaction that comes with discovering a new fantasy series that is just right. And I have come to realize that "my type of fantasy" lies somewhere on the edge between middle grade and young adult. No Veronica Roth, Cassandra Clare, thank you very much, but of course, nothing overly childish either - coming-of-age stories, basically. His Dark Materials, Tiffany Aching, Bartimaeus Trilogy, Earthsea... you see my point? The Belgariad fits that requirement perfectly. It also has that epic quality that makes it even more attractive. In this post, I mostly focus on the first book, Pawn of Prophecy. This is (a) to avoid spoilers (b) because the rest of the series is one continuous story cut into parts; whereas the first book is more or less standalone. At any rate, one book was enough to have me completely head over heels. So here's what it is about. Story: Prologue... The world was created by seven gods. One of the gods fashioned an orb which contained a living soul. Another god, Torak, attempted to steal this Orb but ended up being destroyed by it. 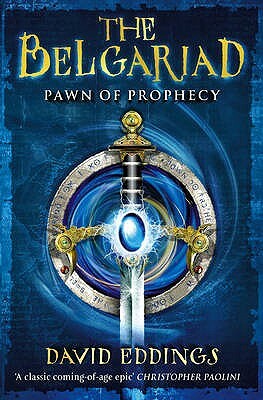 Belgariad was a mighty sorcerer and a disciple of the God who created the Orb. Belgarath recovered the Orb from the evil Torak and, with his daughter Polgara, Belgarath has been protecting the Orb for centuries. In the present day, our protagonist, a young boy named Garion, lives on a farm with his Aunt Pol. He has lost both his parents and is unsure of his family history. One day, a mysterious storyteller called Mister Wolf arrives on their farm and warns Aunt Pol of a strange, important object that has been stolen. Much to Garion's surprise, Mister Wolf whisks them away on a quest to find this stolen object. And as the journey progresses, Garion begins to realize that Aunt Pol may not be who he thinks she is... Family secrets and buried mythologies surface as Garion starts to question his own fate. Language: This book was written in 1982, which in Fantasy years is not that long ago. Of course, it's much before books like the Bartimaeus trilogy were penned, but around the same time as Ursula K Le Guin or Philip Pullman's writing. Naturally, the writing has a bit of that oldsy style; a little wordy and solemn... slightly dated if you will. The latest trend in coming-of-age fantasy seems to be this informal banter (think Rick Riordan), smug, sarcastic, conversational, school-kid-talk. With The Belgariad, I'm glad to read another children's book that speaks of childhood without trying to sound like a child. World Building: What makes Neil Gaiman's writing so appealing? One reason is how he gives us brief, blurry-around-the-edges glimpses into his worlds. Carefully manicured scenes which give the faintest promise of wonders hidden behind his veils. With every new page you turn, you yearn more and more for those quick looks, begging him for scraps of new detail, which he gleefully provides peppered across the story. In her own way, J.K. Rowling also does that - that's why Pottermore still works or we rush to watch Fantastic Beasts and glow warmly when Hogwarts is mentioned. They let on just enough about their world that we are convinced it's complex, without ever letting on too much. It's an accomplished story telling skill. But it's not world building. David Eddings does the opposite. While Rowling's world seems to grow even today and she piles more details every passing year - Eddings' world is all ready when he tells us this story. Each character has a story, a motive, a place in the world, or a conflict within himself - from the smallest shadow who passes by on the street to the many kings of the empires in this land, even his gods grieve and think and second guess and love - every character matters and earns your sympathy. The history is written. It is narrated throughout the story. And the detail makes it so that the world couldn't not exist. Incredibly immersive. Characters: The characters - the hundreds of tonnes of characters - each have a distinct personality, and with it, a voice, which has so much to do with language. Wolf is old, cheeky, wise but has grown weary with age; Pol is a formidable creature but at once also motherly, caring, hence well respected; Garion is curious, innocent and as if on principal, good. Even supporting characters like Silk and Barak ooze their own drama and charm. Initially, Eddings makes a biased narrator and it is quite clear whom you're expected to like. This is typical in fantasy, so commonplace that they're the norm... one might even consider it wrong to expect more? 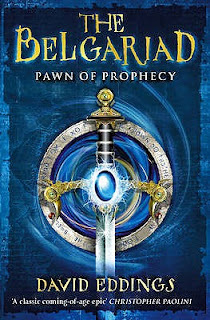 The characters of The Belgariad do grow over time and by the end of the series, context will turn these caricatures drawn from Book 1 meaningless.